Event signs and displays These banners signs made are fitted to the portable sign crowd event barriers using plastic zip ties (cuff ties) and pulled slowly 'half' tight. Walk along the barricades and around 100 feet (30 metres) later come back, to adjust the tensions and straightness of the fence and banner they will be tightened, snap closed and trimmed off using cutters. IMPORTANT: Don't buy your banners too bulky. Sectionalize each sponsor to about 30-40 feet (10-15 metres) long. That's the best for 1. Putting up straight and tight, 2. Readership, 3. Sponsor happiness and 4. Deploy team carrying weight and speed of install. Too short and it takes too long to install, wont be horizontal and is harder. The best size to order between 30-40 feet (10-15 metres). This is the best horizontal, sponsor logo repeat and handling size for your deployment teams. Signs Banners Online ship out 3 times per day to all states and now over 100 countries so you know they are supplying good quality printed signs. We recommend them to all event planning companies and promoters. This method of fitting your event signage is the best and easiest. It's how we do it. 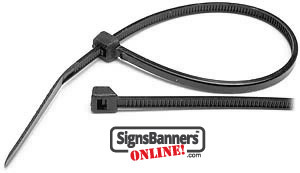 TIP: Buy a few hundred zip ties at 8" long so that they wrap around the metal bars and through the inside of the grommet and banner. TIP 2: If you fly over a 2 barricades then make a big loop in the first zip tie and use it to 'daisy chain' to the next grommet position or metal bar. Remember... when ordering your sign printing inform the producers the distance apart for each grommet, fitting point or fastener location if you are using non standard fence panels. Dont over pull the banner or stretch it. Some movement for wind and flap makes it better and wont pull the grommets. Some event managers and companies use two or three different fence suppliers and all have slightly different nuances to their temporary fence hire sizes. Check first, then design your banner signs with this knowledge. 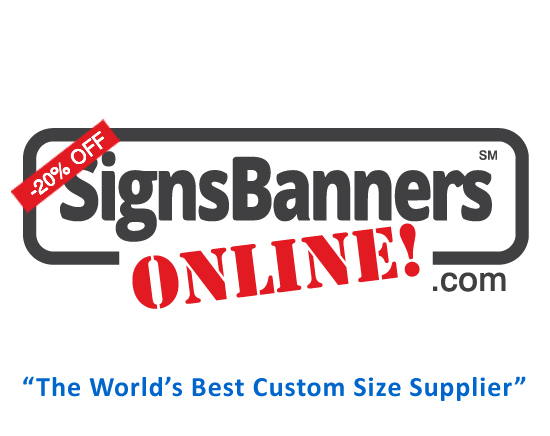 Signs Banners Online supply continuous, custom and 'per size' printing banners for events and displays. They are very experienced and helpful with super cheap prices. If you have a graphic designer, they can upload your signage into the production factory saving time and lots of money. To put up your media walls or backers ask for hook fastener to be sewn on the rear side. Then you can press it onto your loop fastener or carpet walls display boards etc. There is another video for that.